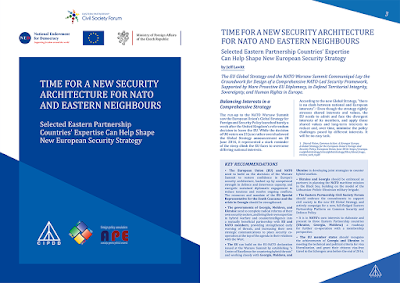 NEW DIPLOMACY was launched in November 2015 to address the policy challenges facing global and regional policymakers in the eastern and southern neighbourhoods of the European Union, not least the insecurity in the post-Soviet space and the crises of democracy and instability in the Middle East. The founders are a group of policy analysts and media professionals, each with several decades’ experience leading projects in promoting EU integration and closer Euro-Atlantic relations, and in strengthening civil society in the post-Soviet space. NEW DIPLOMACY is a non-profit association registered in Prague, Czech Republic. ‣ international advocacy and engagement with other players in the fields of media and diplomacy. ‣ The League of Nations was established in 1919 to move away from the "alliances" of convenience forged among leading powers, often dubbed "old diplomacy", towards a "new diplomacy", moving away from narrower alliances towards universal compliance with a set of general principles embodied in international law, and the abandonment of "power politics", or the use of force to settle conflicts. This idealism and universal rule-based approach needs updating to reflect a world where some of the leading powers respect neither democracy nor human rights nor the sovereignty of other states while holding a veto in the Security Council of the United Nations - the successor to the League of Nations. It also needs to address the information challenge - where such powers have not only military capacity, but are committing huge resources to global media operations with the clear goal of re-writing history through distortion and lies, while the majority of members of NATO have been reducing their defence budgets, and the number of foreign correspondents for quality, independent media has been in decline. ‣ "New diplomacy" is needed to re-ignite debate around the real and urgent policies that must be taken by the North Atlantic alliance, and about how to reboot global governance such that UN vetoes do not thwart necessary actions to support the sovereignty of democratic nations or stall humanitarian and military intervention needed to save lives and protect human rights. ‣ Thirdly, there is a crisis of confidence in international diplomacy, not least in the prospects of strategic, long-term diplomacy to forge a more peaceful international settlement in the post-Cold War period. This requires a "New Diplomacy" that builds on the greater engagement of non-governmental actors, such as those who campaigned for the Responsibility to Protect, and others that have engaged as brokers in South Sudan, Transnistria and elsewhere. A range of initiatives are needed, from the projects of professional, non-governmental diplomats to stronger "public diplomacy" on the part of governments, and all-round a much greater engagement with citizens (and non-citizens) to widen appreciation of the challenges facing the international community, e.g. the EU and NATO, but also countries facing the threat from ISIS in the Middle East. Citizens and non-citizens alike have a right to understand the sacrifices that they are likely to have to face, and in the era of social media they have the potential to play a much more engaged role in the debates that will shape future policies in international relations. NEW DIPLOMACY is a new initiative, launched in 2015 by a group of policy analysts and media professionals, each with several decades’ experience leading projects in promoting EU integration and closer Euro-Atlantic relations, and in strengthening civil society in the post-Soviet space. The founders are Jeff Lovitt (Chair), formerly Executive Director of the PASOS network of independent think-tanks, Dr. Leila Alieva, President of the Centre for National and International Studies (CNIS) in Baku, Azerbaijan, Krzysztof Bobiński, President of Unia & Polska foundation, and Jan Piekło, Executive Director of the Polish-Ukrainian Cooperation Foundation (PAUCI). For more information about the founders and contact details, click here.